This is the original black and white beanie tush tag. They either have copyright dates of 1993 or 1995. Beanies with this tush tag should have a 1st, 2nd or 3rd generation heart tag. Some of these tags say "For Ages 3 And Up" on them, and some also have CE on them. Also the beanies name is not yet on these tags. These tags can say "HAND MADE IN KOREA" or "HAND MADE IN CHINA." One version of this tag says "HAND MADE IN KOREA" but does not have the "SURFACE WASHABLE" or the "FOR AGES 3 AND UP" printed on them. This ta g has the 1993 date printed on it. 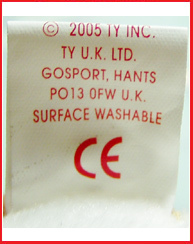 All second generation tush tags have a large red heart with ty written on the inside, there is also a ® symbol to the lower right of the heart. These tags don't have the beanies name on them yet! These tags can have 1993 or 1995 copyright dates on them. They have either "Made in China" or "Made in Korea" on them. Also the first of these tags say "For Ages 3 and Up" the later ones do not. These third generation tags now have "The Beanie Babies Collection" added to the top of the tush tag with a  at the end of "Collection". The heart on these tags is a lot smaller now and still has the ® symbol under it. Also the beanies name has been added to them. These tags can have the following copyright dates: 1993, 1995 and 1996. They can also be made in China or Korea. This tag has a few mistakes: The first Libearty's had the word Beanie misspelled "Beanine", and there was also a TM trademark printed above the word "Babies." Sly's tag had "Surface" misspelled as "Sufrace." The first of these generation tags were in the process of changing, they were third generation tags with a new star added to the top left corner of the heart, the star was actually at first a clear sticker added to the tag with a star. When the tags were finally printed no other changes were made. These tags have the dates: 1993, 1995 & 1996 and can have "HANDMADE IN CHINA" or "HANDMADE IN KOREA" on them. 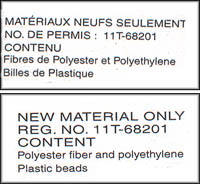 5th generation tags were introduced in October of 1997 with many new changes from the previous tag. "The Beanie Babies Collection" at the top of the tag now has a ® symbol added after the word Babies. And there is an additional  at the end of the beanies name. These tags can have the following dates: 1993, 1995 or 1996 and can have "HANDMADE IN CHINA" or "HANDMADE IN KOREA" on them. These tags were introduced during January of 1998. Once again the trademark symbols changed, there is now no ® after "Babies", but instead its after "Collection". 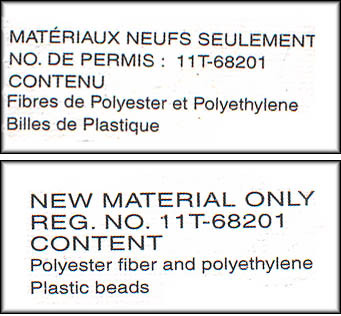 These tags can either say they have PE or PVC pellets in them. In June of 1998 some of these tags started to have the red Chinese stamp inside of them. This stamp indicates which factory the Beanie was produced in. The following dates can be on these tags: 1993, 1995, 1996, 1997 & 1998. They can also have "HANDMADE IN:" CHINA, KOREA or INDONESIA printed on them. 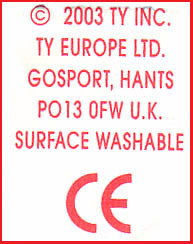 This tag is seen on beanie released after Jan, 1999. These are the first tags to sport the new morphing hologram above the beanies name. There is also a "Ty" light red heart in the middle of the tag, looks like a watermark, it is actually a heat activated disappearing ink symbol. Under heat it will disappear, this is to help stop the making of fake beanies. These tags have no chinese stamp on them. This tag looks exactly like the 7th generation tags however they are now a not a loop tag. These tags were introduced in March of 2000. These tags returned back to the traditional loop format, these tags also have a 8 digit alpha numeric code stamped to the inside of them. The front now has a new hologram with "ty" and a star alternately reflecting inside of the heart. "Beanie" appears above the heart, and "Babies" can be seen underneath. There are also tiny hearts and stars printed in the holograms background. These tags still have the disappearing heart on them. Again a new hologram was created and added to these tags. These tags were released in January of 2001. The hologram now seems more complex, the surrounding background has changed from tiny hearts and stars to diagonal line patterns of the words "Beanie Babies". There are also multiple thin lined designs of various sized hearts and stars that alternate around the perimeter of the center "Ty". The 11th Generation tush tag was introduced on December 27, 2001 with the announcement of the new 2002 January releases! These tush tags can have 2001 or 2002 dates! The hologram has an image of a Bear with its arms wrapped around a heart, this is very difficult to see though! The 12th generation tush tags started to appear in 2002 with the introduction of the special edition Mastercard Anniversary Beanie along with the new 11th generation hang tags. Only a few minor changes to the tags, the hologram now has the Ty Heart logo in the middle and the hearts and stars in the background are smaller then in the 11th generation tush tags. These can have 2002 or 2003 dates on them. 12th generation version two tush tags started to appear on HERO and Peace 2 during April 2003. Only a few changes were made to the tag, the CE has been moved to its own line and is now much larger. Depending on which new Beanies come out with this tag. Beanie Babies in July of 2003 started to appear with these newly designed tush tags! They have a simple yet elegant look to them with that red foil design! These tush tags can have a 2003 or a 2004 copyright date on them. In early 2004 when the U.K. Beanies started sporting new hang tags (12th generation) they also received the new 13th generation tush tags, they have a few differences, a U.K. address and no made in China line. Click photo for a larger view! Version #2: These new tags started showing up in July of 2004. The main Ty Heart is now just red instead of metallic red, and also now the "Ty" inside of the heart is gold not white. These tags should have a 2004 copyright date on them. So far only a handful of Beanies have these tags. All beanies distributed in Canada have this additional tush tag on them. This is required in order to meet Canadian toy import regulations. 2002 Canadian Tags: Canadian tush tags went through a change in 2002 with the introduction of Kanata on September, 30, 2002. The tags became much thinner. There are a few rare embroidered tush tags on the market for beanie babies. All beanies seen with this tag have a second generation hang tag and the standard Canadian tush tag. This tag also has the date of 1994, no other tag has a 1994 date on it. It is rumored that these tags were all a mistake, normally they are seen on Ty Classic Animals. These tags have been seen on Bones, Blackie, Chilly, Chocolate, Cubbie, Goldie, Pinchers, Quacker, Spot, white belly Nip, Peking, NF Colored Teddy, Ally, Daisy, and white bellied Zip.